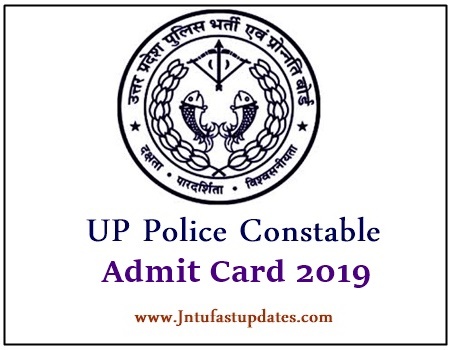 UP Police Constable Admit Card 2019-2020 : Uttar Pradesh Police Department has recently notified 49568 police constable vacancies. Many of the aspirants wishing to become the police constable have applied for the announced Constable (Citizen Police), Constable (Provincial Armed Constabulary) posts. The UP Police Department has announced the police constable Exam/ written test dates as 27th & 28th January 2019. All the hopefuls who are going to appear for the written test must download UP Police Constable hall ticket 2019, Exam Center,City to proceed with the examination. Candidates can visit the UP Police Recruitment and Promotion Board (UPPRPB) official website, uppbpb.gov.in to download the admit card. The board released UPPRPB Police Constable Call Letter in their official website from January 3rd week 2019. Keep visiting the official website on regular basis for latest updates. UP Police Admit Card 2019: Uttar Pradesh Police Recruitment and Promotion Board (UPPRPB) is the state level police department that looks the safety and security issues in the state of UP. The organization annually announces various notifications depending on the requirement. Candidates seeking to get police jobs can keep visiting the UPPRPB official website on a frequent basis to check the latest notifications. This year, the UPPRPB has opened a large number of police constable vacancies. The UPPRPB has released recruitment notification for 49568 police constable posts in the month of January and accepted the applications from 19th November to 10th december 208 from the interested and eligible aspirants. More than 3 Lakh aspirants have applied for the UP Police constable posts, as per the organization reveals. The candidate selection will be based on various tests physical eligibility test, physical standards test, written test, and GD/Interview rounds. Candidates who qualify each round will be finally given the opportunity to work as the police constable. Candidates who have applied for the police constable posts will have the written test on 27th & 28th January 2019. Applicants have to compulsorily download the admit cards to appear for the written test. UP Police Constable admit card 2019 will be accessible to download from 23rd january. Admit card/hall ticket is the most required document to proceed with the examination. Candidates have to download and preserve the hall ticket to appear for the examination. Candidates who do not show the admit cards at the time of verification will not be allowed to sit for the examination. Hence candidates have to download and carry the admit card without fail.